Are you joining us for a gender scan + well-being or have an upcoming appointment? Wondering what to expect? Well don’t worry…here we’ll answer all your gender scan queries! Can I Have a Gender Scan Before 16 Weeks? We are incredibly proud to offer a 99.9% accuracy rate from 16 weeks, which is why we don’t offer gender confirmation before this gestation. This is to ensure that our ladies walk away 99.9% sure of sexing and you are able to find out boy or girl a full 4 weeks before your 20-week anomaly scan. Please drink plenty of water (a couple of glasses will do) as being hydrated can put fluid around baby, and help with the overall quality of the scan. We also ask our ladies to arrive with a reasonably full bladder (not so you’re uncomfortable though!) You would need to have had your 12-week NHS scan before you come to us. Make sure you have your hospital notes ready to bring to your appointment. If your notes are digital – have the details of the hospital you attended and when you had your scan. Don’t worry – this is just in case our Sonographers need to refer to the notes. Aim to arrive about 10 minutes before your appointment. When you arrive, you will be asked to fill out a quick form about your pregnancy in our waiting room. We will also ask for some extra details about your pregnancy to ensure our Sonographer and team are completely informed about the reason for your visit. Our clinic teams will be on hand to answer any questions and all of our clinics allow friends, family & children to join you. Get in touch with the team to find out how many loved ones you can bring. Can You Keep the Gender a Secret? Yes! We get many families that want to keep the gender a secret until a later date. Whether you want to find out at home or have a reveal party planned, just let the team know when you arrive. The Sonographer can pop the gender in an envelope for you and will ask you to cover your eyes when they’re confirming boy or girl. Our clinics also have gender reveal extras available to enhance your experience – so feel free to ask the team what’s available. 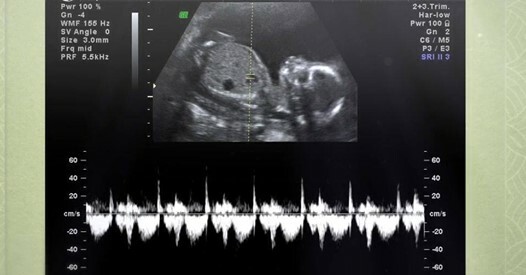 The Sonographer will begin by checking the well-being of baby. This includes assessing the limbs, spine, abdominal contents, brain and visualising & listening to the heartbeat. We will look between the legs to determine boy or girl. If baby is in a difficult position, we will do all we can to confirm gender. We may ask you to take a short walk or have a cold drink to get baby moving. 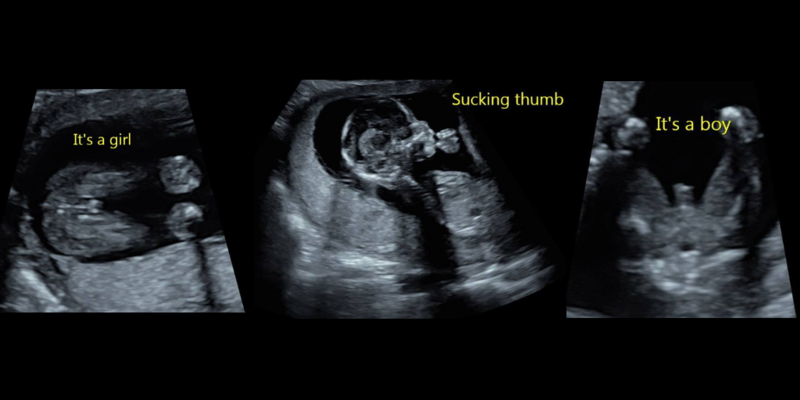 We will round off your scan by giving you and your family a glimpse at what baby is up to. This will be done in 4D view. We understand that finding out whether you’re having a little-Miss or a mini-Mr is an exciting time…but the first thing we always do in our scans is check that baby is healthy and your pregnancy is progressing as it should be. 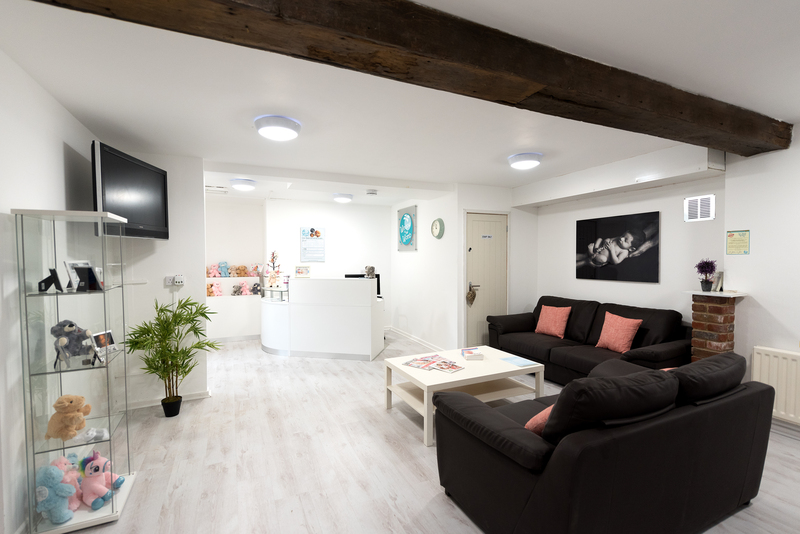 Our clinics have close relationships with local NHS hospitals, should you require on-going care. If you have any questions during your scan, feel free to ask your personal scan assistant or Sonographer; they’ll be happy to help. When your scan is complete, you’ll be lead to our printing area to choose images of baby to print. You’ll also receive all your digital images to our Bumpies app. Download the app for free on IOS or Android, then the print assistant will give you a code. Enter the code and you’ll then have full access to all your scan memories. You can also create week-by-week time-lapse videos of your bump with Bumpies! Our Gender & Well-being packages are available from 16-22 weeks and retail at £59.00. Be sure to check your nearest clinic page for any local offers. Congratulations and we look forward to meeting you!